It was about 4 years ago that an unfamiliar guy named Lord Steak released a hack for Zelda 1 called "Shin Zelda Densetsu". It's available on Zophar's Domain, and I'm not sure where else. Some of you may have played it, or perhaps no. I'm rather surprised by how obscure it still is. As you can see, you play the quest as Zelda. This is the boss room in Level 3, or rather the Mars level (in SZD, the level numbers are planetary symbols). As you can see, there's nothing you can kill in here, and consequently no way to open the shutter and get to the triforce room. 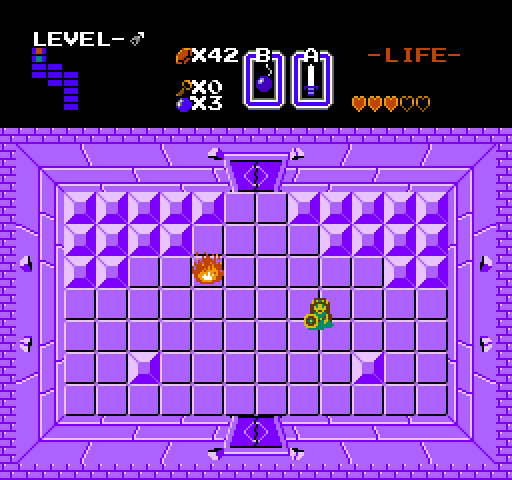 I've gone on to finish all the other levels and throw every weapon I can get at this puzzle, but I can't finish the hack because I can't get into the 9th level, for lack of the triforce piece in this dungeon. I feel like I've tried everything that could possibly work in one of these hacks - - bombing every wall, pushing all the blocks, etc. I've even wondered if this is a bug and there's a specific emulator I need to get this to work right - - I'm using Nestopia, but I've tried it with NESten, Nesticle and Nester and the same thing happens every time. If anyone here has played this game and knows how to get around this trip-up, I'd much appreciate it. Did some searching around. No luck. I assume you have tried walking through the walls? Pushing up against them for a while? What is up with the flame? Well, you tried bombing everything, shooting arrows, slashing, playing the recorder, etc? You could always look for the flag in memory (a cheat) for if all enemies are dead and the doors should be opened. And then set that to true. Or try to get a walk upwards through walls code. You could also cheat by changing the room number when in the room under that room, to the room number that is in, so that when you travel upward you skip over that room straight to the triforce room. I tried pushing against every wall, found nada. See, that's what I wish I knew. If I were to guess, I would guess that the room I'm in actually isn't the real boss room, it's a trap and you have to get to the triforce piece through rooms that aren't shown. The flame is your only way to escape by letting you die and go back to the beginning of the dungeon. Either that, or it's a nasty bug. What's funny is, I tried dying in the flame, going back to the beginning and came back to this room. When I got there, the flame had moved, it was in the center of the room. I roasted in the flame again, went back to the beginning and came back here again. The flame moved again, this time to the lower-left corner of the room. I thought I was on to some kind of puzzle and died again, went back to the start and came back here again, but the flame didn't move, it was in the same place it had been in the third time. That suggests there is probably some kind of bug in the works. You could always look for the flag in memory (a cheat) for if all enemies are dead and the doors should be opened. And then set that to true. Or try to get a walk upwards through walls code. You could also cheat by changing the room number when in the room under that room, to the room number that is in, so that when you travel upward you skip over that room straight to the triforce room. I don't have any experience with ROM editing, but opening up this toy in an editor would be a useful exercise. Even if I don't figure out how the level is supposed to play, at the very least I could see if there are hidden rooms in this "DMap" (or whatever the equivalent structure is for a rom hack) and then maybe it might turn out that Lord Steak forgot to open up one end of a passageway or some such. So the flame can't be "killed" like in the last room where you rescue Zelda? That was what I was asking. Did you try killing the flame with a sword? Have you stood against the outside wall long enough to see if the hands come down to try and grab you? That flane probably can be killed. Try unloading all of your weapons on it. Try using some of you items on those blocks. Is there a possibility that it's a fake level, with no triforce peice at all? Honestly, I'd have to say that the explanation that it is a way out if you're trapped there seems most likely. That would mean that what you need to do in this room is dependent on something you could run out of - namely, bombs, arrows, candle flame, potions, rupees, or the sword beam. Is there any possibility that there might be another entrance to the level? Okay, I was in luck; my sav file from back in '04, where Zelda had all her weapons from the rest of the quest, was still around. The boss room is, in fact, impregnable. Nothing kills the fire, and none of Link's - - er, Zelda's weapons work on anything in the room or the walls. I couldn't help but finally follow the Mottzilla tack, and opened up the level in a dungeon editor. The dungeon has no rooms that are "off the map". There is nothing in the boss room according to the ROM data. Implying from the shape of the blocks in the boss room, and the roaring sound you hear in the room before, I am 90% certain that it is a bug and the guy forgot to put the dungeon boss into the room. I went ahead and took the liberty to hack a two-headed gleeok into the boss room. When I opened it back up in the emulator and returned there again, sure enough, the gleeok was there, and the flame in the middle of the room was gone (Hmmmmz.......). Upon the defeat of the gleeok the doors opened, and I managed to acquire the third golden partition of power. So there you have it. On Cinco de Mayo, Shin Zelda Densetsu is finally free.